Unlimited Golf package treats golfers to Maryland’s ‘Must Play’ course at the Cambridge hotel and resort, and is available through December 30, 2014. Avid golfers will want to take advantage of the Unlimited Golf package at Hyatt Regency Chesapeake Bay Resort. Golf isn’t just a game for adults. 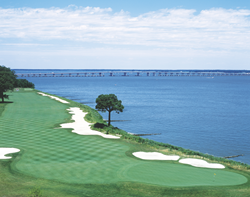 Just ask the PGA/LPGA pros at River Marsh Golf Club located at the Hyatt Regency Chesapeake Bay Golf Resort, Spa and Marina along the picturesque Eastern Shore. The AAA Four-Diamond resort offers an Unlimited Golf package, as well as several clever ways for the entire family to golf on its championship course, rated one of Golf Weekly’s “Best Courses You Can Play” in Maryland. Hyatt Regency Chesapeake Bay has a 4-Hole Family Loop program that allows families to play the first four holes only, which is just enough for a young, beginner golfer. In addition to wide open fairways and large greens, the course offers youth tees to make each hole a shorter length. Another youth program available at the resort is called SNAG (Starting New At Golf). Large-faced clubs and colorful tennis balls help junior golfers learn where the ball should meet the club face, and how hard they need to swing. Avid golfers will want to take advantage of the Unlimited Golf package at Hyatt Regency Chesapeake Bay Resort. Overnight rates start at $339 per night and include unlimited golf for two, golf cart, rental, use of practice facilities, discounts on professional golf lessons and much more. Unlimited Golf is available through December 30, 2014, and is based on double occupancy, subject to availability. The first round of golf must be reserved prior to arrival. Taxes and resort fee additional. Reservations must be made in advance. To book this package, please call 800.633.7313 or visit http://www.chesapeakebay.hyatt.com/. The Hyatt Regency Chesapeake Bay Golf Resort, Spa and Marina is the premier four-diamond resort of the Chesapeake Bay. The property is nestled on 342 magnificent acres along the Choptank River, and features 400 luxurious rooms and suites. Among amenities are six superb dining options; an award-winning, 18-hole championship golf course; the 150-slip River Marsh Marina; the Sago Salon & Spa; multi-level indoor and outdoor swimming pools; a fitness facility, and a children's recreation center. For more information on the Hyatt Regency Chesapeake bay, please call (800) 633-7313 or visit chesapeakebay.hyatt.com. Follow Hyatt Chesapeake Bay on Facebook at http://www.facebook.com/hyattchesapeake, Twitter @hyattchesapeake; or Instagram #HyattChesapeake.